This article is provided as information only. The information contained in this article are provided without any guarantee of any kind, either express or implied, to the fullest extent permissible pursuant to applicable law. I make no guarantees that this information is correct, and fit for the purpose you may put it to. Under no circumstances, including, but not limited to, negligence, shall I be liable for any loss or consequential loss that result from the access or use of, information from this article. 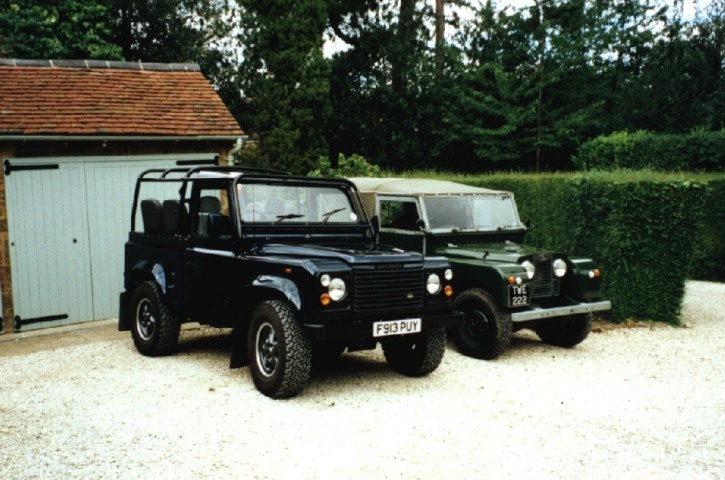 This article is basically a guide for fitting Land Rover alloys wheels to a Defender (when I say Defender I'm including pre-Defender 90/110 as well) with drum brakes on the rear axle. The perceived wisdom is that alloy wheels cannot be fitted to vehicles with these axles, as there is insufficient clearance for the wheel. Well they do (well, will) fit, and here's how. Firstly, jack up the vehicle and remove the existing wheel from the corner you want to work on. Apply something coloured and easily visible, like engineer's blue or copper anti-seize grease to the orange and yellow faces shown above. Make sure the new wheel is clean on the inside, then try to put wheel onto hub. It probably won't sit down on the back plate (shown in blue above) properly, but wiggle the wheel around to transfer some of the blue/copper grease onto the wheel. Remove the wheel. Look at the inside of the wheel, and the hub. This will give you an idea of where the wheel is fouling the hub, and where you need to file away to make the wheel sit properly. If the wheel is fouling the bolt heads (yellow in the diagram) and the bolts have spring washers under them, you can remove the spring washers and use Loctite (thread lock) to replace them. This should give you a bit more clearance. Attack the bolt heads and the orange rim with a file, removing a small amount of material wherever the wheel is catching. Then try refitting the wheel, and using feeler gauges determine the gap between the wheel and the hub backplate. If there is no gap at all then you're done, and you can move on to the next hub. If there is still a gap, repeat steps 3 to 7 until there is no gap, then move on. Once you've done all the hubs, you can then get the tyres mounted! If you only have wheels with the tyres already on, you can do it with the complete wheel and tyre assembly, but you'll probably need two people! Or you could try and blag another wheel the same to use..
That'll be one 1988 Land Rover 90 with Land Rover alloys fitted to it. Bingo! If you have any comments/queries about this article, please contact me.